CAREER: Ryan was introduced to music as a single second-pan player in his church's conventional steelband where he learned to play folk renditions of church choruses and gospel standards. He began playing the saxophone with the school band at Trinity College where he was first exposed to jazz by his music teacher who took him under her tutelage. In 2006, he won the J.T. Johnson Trophy for woodwind solos at the Trinidad and Tobago Music Festival. He went on to make numerous solo appearances and perform with local jazz groups. He formed his own group in 2011, The Jesse Ryan 6-tet, performing his own compositions while continuing to be a member of the Dayo Bajide Jazz Project, a local jazz quartet. Ryan was awarded a partial scholarship to Berklee College of Music, Boston, Massachusetts, USA, where he is currently pursuing a Bachelor of Arts degree in Jazz Composition and Performance. In addition to performing in Trinidad & Tobago at the 2006 Carifesta, the Mt. 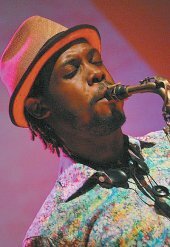 Irvine Jazz on the Beach, and the Pigeon Point, Tobago, Jazz Experience, Ryan has performed throughout the Caribbean and represented Trinidad at the Virgin Gorda Jazz Festival in the British Virgin Islands.